Mumbai: The country’s central bank, the Reserve Bank of India (RBI), faces a tricky balancing act in fighting inflation, expected to surge in coming months and keeping the country’s fragile economic recovery on track, economists say. Central banks across the world are facing similar dilemma after cutting interest rates aggressively in the face of the world financial crisis and now having to decide when to start tightening policy as recoveries take root. India, Asia’s third largest economy, reported a return to inflation last week as a result of soaring food costs fuelled by a bad monsoon and economists said they expected further sharp price rises in the months ahead. Annual inflation, which had been in negative terrain for 14 weeks, rose 0.12% for the week to 5 September, according to the latest Wholesale Price Index (WPI) figures, India’s most watched cost-of-living benchmark. “In the coming weeks, inflation is expected to rise on a sustained basis, up to 7% by March 2010," said Siddhartha Sanyal, economist at Edelweiss Securities Ltd. Some analysts believe inflation could hit 8% by March. The resurfacing of inflation, along with a still nascent economic recovery, has confronted RBI with a dilemma about when to take the first steps to tighten monetary policy to keep a lid on prices. RBI governor D. Subbarao struck a hawkish tone last week, saying “inflationary pressure (in India) is a more urgent concern" than elsewhere, raising the prospect he might move before other central bankers. But at the same time, he said, “We will not exit from the accommodative monetary policy unless we are assured recovery is secure." 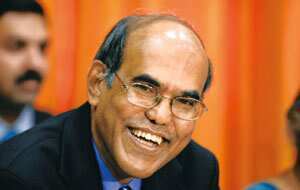 Economists said Subbarao’s words underscored the delicate nature of the bank’s task. “A timely exit policy is critical to achieve the fine balance between avoiding risks to domestic asset prices and choking early signs of growth recovery," Sanyal said. RBI has cut interest rates six times since October 2008 with the repo, the rate at which it lends to commercial banks, now at a record low of 4.75%. The reverse repo, the rate at which it borrows from banks, is at a record low of 3.25%. The economy grew by 6.7% in the year ended 31 March —the slowest rate since 2003 and down from 9% a year earlier. The central bank expects growth of “around 6%" for the current fiscal year—still strong by anaemic world standards but not enough to make a dent in India’s widespread poverty. In coming months, the bank may raise the percentage of cash commercial banks must keep in reserve—the cash reserve ratio—instead of hiking policy lending rates directly, analysts said. This would have the effect of cooling credit expansion and hence inflation. Goldman Sachs economist Tushar Poddar said he expects “a 300 basis point tightening in policy rates in the calendar year 2010" but most analysts do not see an actual interest rate rise until April. Thanks to its still mainly domestically focused economy, India has weathered the global downturn better than many of its Asian peers that fell into recession. The Congress-led Indian government has indicated its main concern is to steer the economy back to annual growth rates of 9%-plus that the country enjoyed before the global financial crisis struck. While the central bank is independent, it would face strong political opposition to any move to tighten rates until economic recovery is firmly entrenched, analysts say. RBI “is keen to exit from its expansionary monetary policy, but will wait for some time", Rupa Rege Nitsure, economist at state-run Bank of Baroda, said.